Just by changing your air filter to an aftermarket, you can not only get a horsepower boost, but an increase in fuel economy as well. 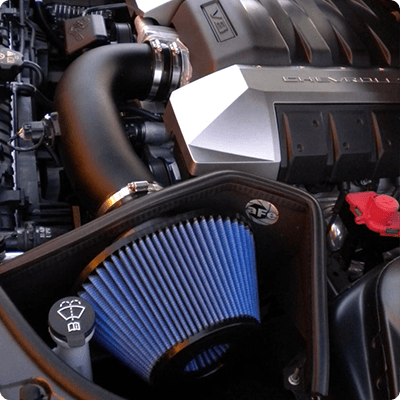 The ability to clean these filters also extends their life considerably.Changing up the complete air intake system will reduce air turbulence and resistance as well as place the intake duct in a location of the engine compartment where it will receive cool fresh air. The placement can provide the ram-air effect to give positive pressure to the system while driving at high speed. The cold air drawn away from the engine is more dense, containing more oxygen, allowing for more power. The combination of these strategies will increase your horsepower and torque upwards of 20hp&tq! Contact our parts specialists to find out what we can do for you and your vehicle.